Congress shall pass no law limiting the rights of persons to manipulate, operate, or otherwise utilize as they see fit any of their possessions or effects, nor the sale or trade of tools to be used for such purposes. From Artraze commenting on this Slashdot story about the levels of DRM in Windows 7. I think it maybe needs some qualification about not using your things to cause harm to other people, but it’s an interesting idea. See also Mister Jalopy’s Maker’s Bill of Rights from Make magazine a couple of years ago. Review: Katyal, N. K. “Architecture as Crime Control”, Yale Law Journal, March 2002, Vol 111, Issue 5. Professor Neal Kumar Katyal of Georgetown University Law School, best-known for being (successful) lead counsel in the Hamdan v. Rumsfeld case dealing with Guantanamo Bay detainees, has also done some important work on the use of design as a method of law enforcement in both the digital and built environments. This article, ‘Architecture as Crime Control’, specifically addresses itself to a legal and social policy-maker audience in terms of the areas of focus and the arguments used, but is also very relevant to architects and designers open to being enlightened about the strategic value of their work. Specifically with regard to ‘architectures of control’ and ‘design for behaviour change’, as one might expect, there are many useful examples and a great deal of interesting analysis. In this review, I will try to concentrate on examples and design techniques given in the article, along with some of the thinking behind them – the most useful aspects from the point of view of my own research – rather than attempting to analyse the legal and sociological framework into which all of this fits. It is time to reverse-engineer cyberlaw’s insights, and to assess methodically whether changes to the architecture of our streets and buildings can reduce criminal activity. A theme to which Katyal returns throughout the article is that the policy response to James Wilson and George Kelling’s influential ‘Broken Windows’ – “an architectural problem in crime control” – has largely been a law enforcement one (“prosecution of minor offenses like vandalism in an attempt to deter these ‘gateway crimes'”) instead of actual architectural responses, which, Katyal argues, could have a significant and useful role in this field. other examples, such as a cafÃ© that hired an architect to design a chair that placed “disagreeable pressure on the spine if occupied for over a few minutes” and Conrad Hilton’s decision to move couches out of hotel lobbies to minimise the number of lingering visitors. (4) Protect targets of crime. Effective design requires input by the community. Without such input, security features are likely to be resented, taken down or evaded (consider the ‘security’ doors propped open on campuses today. Images from Katyal, N. K. “Architecture as Crime Control”, Yale Law Journal, March 2002, Vol 111, Issue 5. [In the first image] the informal areas are blocked form sight and far from school grounds. Because no central place for congregation exists, students are spread over the grounds, and there is insufficient density for monitoring. The four open entrances and exits facilitate access to the school and escape. First, it helps anyone viewing a situation to see it more clearly and thereby deters some crimes by increasing the powers of perception of those watching. Second, it encourages people to be in the area in the first place because the greater visibility creates a sense of security. The more eyes on the street, the more visibility constrains crime. Monuments and markers can also demarcate the transition from public space into private space… A study of burglaries in Salt Lake City… revealed that houses with nameplates had lower rates of intrusion than those without them. One rather simple way is to place two buildings in an ‘L’ formation with a fence that completes the triangle. Children can play in the open space, and adults can look out of their windows at their children. Images originally from Stollard, P. Crime Prevention Through Housing Design and included in Katyal’s article. …even the placement of seats and benches can bring people together or divide them, creating what architects call, respectively, sociopetal and sociofugal spaces. 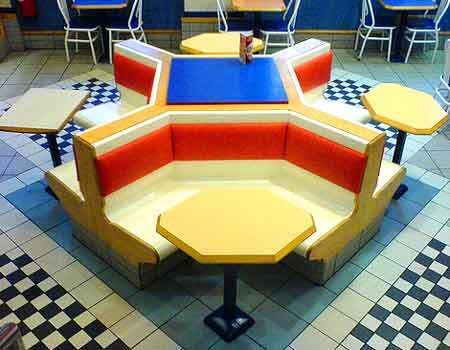 Some architects self-consciously create sociofugal spaces by, for example, designing chairs in airports that make it difficult for people to talk to each other. Practically, ‘building community’ would necessarily appear to be slightly more nebulous than some of the other mechanisms, but even techniques such as encouraging people to spend more time in communal areas such as a laundry (and hence potentially interact more) can be important here. Modern technology permits targets to be hardened in ways that are not obvious to the public. Strong plastics, graffiti-resistant paint, and doors with steel cores are a few examples. These allow architects to disguise their efforts at strengthening targets and thus avoid sending a message that crime is rampant. Some forms of target hardening are suboptimal in that visibility evinces a fear of crime that can cause damage to the fabric of a community and even increase crime rates. Subtle architecture that gently reinfoces law-abiding norms and prevents a degree of intrusion is to be preferred to explicit and awkward physical barricades that reflect the feeling that a community is under siege. Cheap wire fences do not express a belief in the power of law or norms; rather, they reflect the opposite. The same can be said for ugly iron bars on windows, which express the terror of crime as powerfully as does any sign or published crime statistic. Even the best social codes are quite useless if it is impossible to observe whether people comply with them. Architecture, by facilitating interaction and monitoring by members of a community, permits social norms to have greater impact. In this way, the power of architecture to influence social norms can even eclipse that of law, for law faces obvious difficulties when it attempts to regulate social interaction directly. Architecture can prevent crimes even when criminals believe the probability of enforcement is low… one feature of social norms strategies is that they are often self-enforcing. I think this is a crucial point, and is applicable in other ‘architectures of control’ techniques outside of the built environment and the specific issues of crime. Norms can be extremely powerful influencers of behaviour, and – to take my current research on changing user behaviour to reduce environmental impact – the ability to design a desirable norm into a product or system, without taking away the user’s sense of ownership of, and confidence in, the product, may well turn out to be the crux of the matter. Psychological evidence shows that criminals decode environmental ‘cues’ to assess the likelihood of success of a given criminal act… the design of a meeting table influences who will speak and when, and who is perceived to have a positionof authority. It is therefore no great shock that the eight months of negotiation that preceded the 1969 Paris Peace Talks largely centred on what the physical space of the negotiating table would be. It is said that Machiavelli designed a political meeting chamber with a ceiling that looked asif it were about to collapse, reasoning that it would induce politicians to vote quickly and leave. 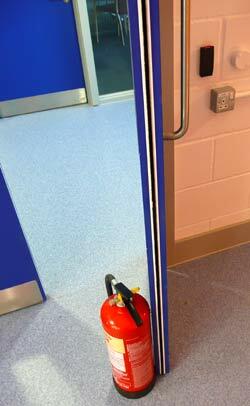 Many devices, such as steel-reinforced doors, strong plastics, and the like are not discernible until a criminal has invested some energy and time. These forms of precaution will thus increase expected perpetration cost and deter offenders without risking substantial displacement. Also, the fact that increased police presence (for example) in a crime ‘hot-spot’ may also lead to crime displacement, is generally not seen as a reason for not increasing that presence: some targets simply are more desirable to protect than others, and where architectural measures allow police to concentrate elsewhere, this may even be an advantage. …the feeling of being crowded correlates with aggression. Architects can alleviate the sensation of crowding by adding windows that allow for natural light, by using rectangular rooms (which are perceived to be larger than square ones), and by employing light-colored paints. When people perceive more space, they tend to become less hostile. While the results should not be overemphasized, psychologists have found results showing that various colors affect behavior and emotions. The most consistent such finding is that red induces a higher level of arousal than do cool colors like green and blue. Another study indicated that people walked faster down a hallway painted red or orange than down one painted in cooler colors. After experimenting with hundreds of shade, Professor Schauss identified a certain shade of pink, Baker-Miller, as the most successful color to mediate aggression… prisoners in Baker-Miller pink cells were found to be les abusive than those in magnolia-colored cells. Studies show that people who sit at right angles from each other at a table are six times more likely to engage in conversation than those who sit across from each other. (referencing Edward T Hall, The Hidden Dimension, 1966). For some existing housing projects, the government could pass regulations requiring retrofitting to prevent crime. Small private or semiprivate lawns near entrances can encourage feelings of territoriality; strong lighting can enhnace visibility; staining and glazing can increase contrast; and buildings refaced with a diversity of pleasing finishes can reflect individuality and territoriality. Large open spaces can be subdivided to encourage natural surveillance. Edward I enacted the Statute of Winchester, a code designed to prevent the concealment of robbers… [which included a] provision [which] directly regulated environmental design to reduce crime… highways had to be enlarged and bushes had to be cleared for 200 feet on either side of the highway. …certain buildings [being strategically placed in an area] such as churches, may reduce the crime rate because they create feelings of guilt or shame in potential perpetrators and because the absence of crime against such structures furthers visible social order. Crimes that directly interfere with natural surveillance should… be singled out for special penalties. Destroying the lighting around a building is one obvious example. Another would be attempts by criminals to bring smoke-belching trucks onto a street before robbing an establishment. Ultimately, Katyal’s aim seems to be to encourage policy-makers to see architectural measures as a potentially important aspect of crime reduction, given sensible analysis of each situation, and he suggests the use of Crime Impact Statements – possibly as a requirement for all new development – in a similar vein to Environmental Impact Statements, and leading to similar increases in awareness among architects and developers. Building codes and zoning policies could also be directed towards crime reduction through architectural strategies. Insurance companies, by understanding what measures ‘work’ and which don’t, could use premiums to favour, promote and educate property owners, similarly to the way that widespread adoption of better design for fire protection and prevention was significantly driven by insurance companies. None of this should be mistaken for architectural determinism or its derivative belief that good buildings alone will end crime. These hopes of ‘salvation by bricks’ are illusory. But our rejection of this extreme should not lead us to the opposite extreme view, which holds that physical settings are irrelevant to human beliefs and action. Architecture influences behavior; it does not determine it. *Katyal also later cites Sommer’s Social Design for the example of airports that “prevent crime by replacing bathroom entrance doors with right-angle entrances that permit the warning sounds of crime to travel more freely and that reduce the sense of isolation”. I’d always assumed that (as with the toilet facilities in many motorway services here in the UK), this was to reduce the number of surfaces that a toilet user would have to touch – a similar strategy to having the entrance doors to public toilet areas pushable/elbowable/nudgable by users leaving the area, rather than forcing recently-washed hands to come into contact with a pull-handle which may not be especially clean. See also Sara Cantor’s thoughts on encouraging handwashing. You see copyright’s suspension of your freedom to perform particular activities, and so for each activity you demand a specific freedom. This is how the GPL arose. This is an inverted perspective from which to define ‘free culture’ (and free software). To define freedom you define its constraints — you do not enumerate the freedoms you want. This is because freedom is what we start off with in the first place. We constrain it to make it better. It is when we under or over-constrain it that we make it worse. It’s the “To define freedom you define its constraints — you do not enumerate the freedoms you want” which especially stands out to me. This seems such an important principle, yet one which so many politicians entirely ignore when they talk about their commitments to ‘human rights’. Whatever the political and legal comparisons might be, the principle is certainly pertinent to the rise of architectures of control in technology. Up until just a few years ago, most technology was effectively ‘open’, assuming you could get hold of it. All of us had freedom to do what we wanted with it – take it apart, modify it, repurpose it, improve it, break it, even if the originators had never expressly intended anything like this, and even if it were ‘illegal’. Now, though, we have (some) technology into which intentions can be codified. We have products with hyper-restrictive End-User Licence Agreements which we must accept before we use them, and which can report back if we don’t abide by them. We have products which are intended to provide one-function-and-nothing-but-that-function, and are designed to frustrate or punish users who try anything different. We have politicians seeking to specify exactly what technology can and can’t do. How do I know what freedoms I want until I’ve experimented? How can I even explain them until I’ve experienced them? Should the progress of tomorrow really be shackled by registering as law the prejudices and errors of today? Of course, in the context of this blog, I’m merely striking the key-note once again, and that can make for a very dull tune. But that phrase, “you do not enumerate the freedoms you want,” will stay with me. It’s important. 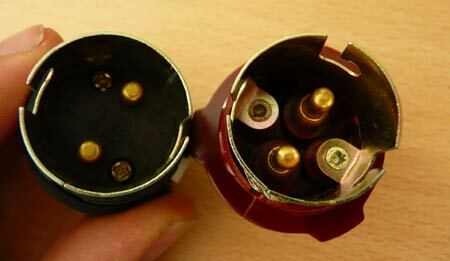 UPDATE: See this more recent post for information and photos of how to get a 2-pin bulb to fit in a BC3 fitting. 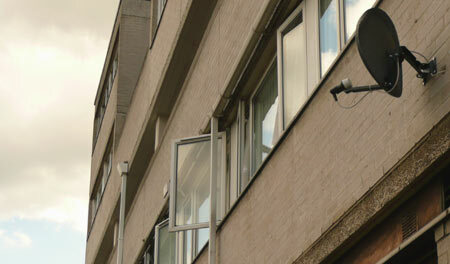 This may well be the example which involves the most different ‘architecture of control’ issues so far – by a long way. It is a complex case with a number of aspects, intentions and effects to consider. My mind isn’t made up on the rights and wrongs of this: it’s certainly an architecture of control, it’s certainly devious and it’s certainly a case of introducing a razor-blade model (product lock-in) into a field where there was previously none; it will also end up costing many consumers more money, yet it’s founded in an attempt to ‘encourage’/force more environmentally friendly behaviour. 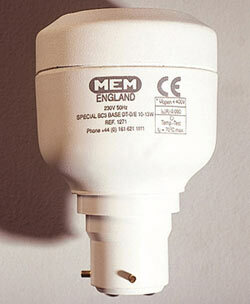 BC3 CFL and standard bayonet CFL compared, and a BC3 fitting. Upper two photos by George Preston; lower photo from BC3 brochure [PDF]. Notice those three prongs are irregularly spaced. A normal bayonet bulb won’t fit in a BC3 fitting, and a BC3 bulb won’t fit in a normal bayonet fitting. 1.54 Reasonable provision should be made for dwelling occupiers to obtain the benefits of efficient lighting. 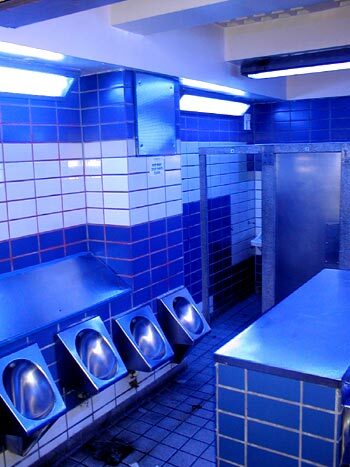 A way of showing compliance with the requirement would be to provide at a reasonable number of locations, where lighting can be expected to have most use, fixed lighting (comprising either basic lighting outlets or complete luminaires) that only take lamps having a luminous efficacy greater than 40 lumens per circuit-watt. Circuit-watts means the power consumed in lighting circuits by lamps and their associated control gear and power factor correction equipment. 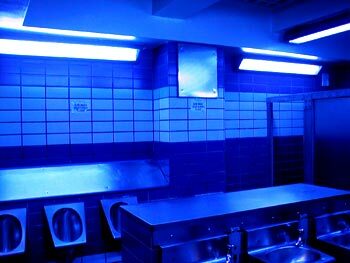 Examples of lamps that achieve this efficacy include fluorescent tubes and compact fluorescent lamps (not GLS tungsten lamps with bayonet cap or Edison screw bases). The idea is, then, that since ‘normal’ bayonet fittings can take normal tungsten incandescent filament bulbs as well as normal CFLs – something which has of course driven the more widespread adoption of CFLs – there is the likelihood/possibility that householders might replace any pre-installed CFLs with filament bulbs, for whatever reason (the usual reasons are the colour of the light, the aesthetic appearance of the bulbs, and the warm-up time). 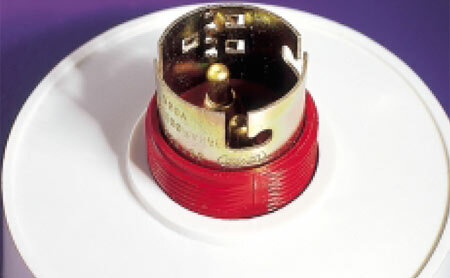 To prevent this possibility, a new type of light fitting and associated CFL cap design were required which were uniquely compatible, so that anyone with this kind of fitting would have to fit bulbs with the new cap design, which would only be available on CFLs. So, Eaton’s MEM 250 division created the BC3 (bayonet-cap-3?) range, being nominated for an Electrical Product Award for Contribution Towards Energy Saving in the process. 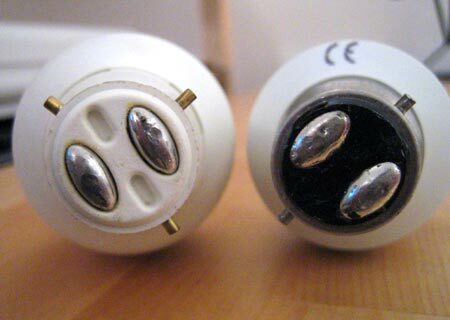 Left: A tube unit with four pin connector; Right: A BC3 base unit (including ballast) to allow the tube to be attached. Images from Ethical Products Direct. From Â£6.35 each is a lot of money. Standard ‘Tesco Value’ 2-pin bayonet CFLs started at 88p each (Tesco, Egham, Surrey) the last time I looked – that’s especially cheap, and they were only 11W, but 15W units are commonly available from about Â£2 – Â£3. Searching Froogle shows that BC3 bulbs start from around Â£10. Even Ethical Products Direct, to whom Eaton MEM’s own website directs visitors wanting to buy BC3 bulbs, charges Â£9.36 for the cheapest complete BC3 unit. This is a lot of money for something which provides the householder with exactly the same function as a standard CFL a quarter the price. (It’s not as if the BC3 bulbs last much longer, for example, or are more efficient. 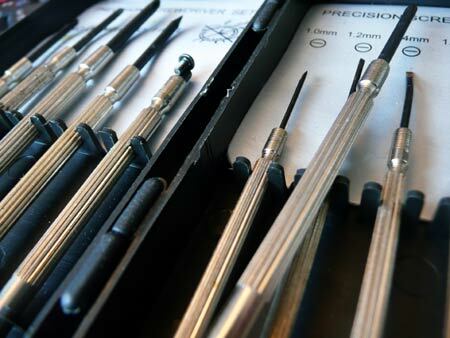 They just have a non-standard fitting and are only supplied by one manufacturer.) 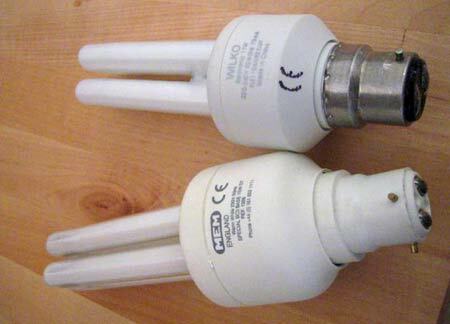 In fact, one might suggest that standard CFLs offer the householder more benefit, since they can be swapped around, fitted all over the place, even fitted to replace incandescent filament bulbs in standard fittings, should someone – shock – actually want to choose a CFL without being forced into doing so. 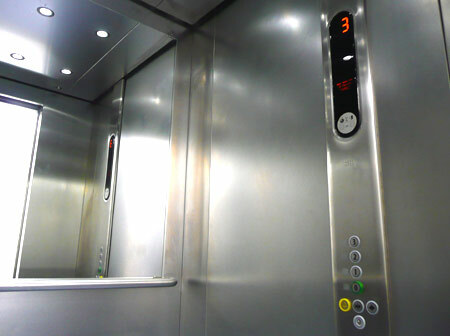 We have recently moved into a new flat which is part of a modern development in London. A few lightbulbs needed replacing when we moved in, so I went out and bought some (they’re all energy-efficient ones so I bought the same to replace them with). But oddly, none of them would fit in the fittings. I was under the impression that there were just Bayonet and Screw Cap fittings? These fittings were bayonet, but needed three, irregularly-spaced pins instead of the standard two. replacement was an energy-efficient type anyway, but it seems illogical and a shame that properietary fitting sizes have been introduced into something that has always been so simple – choosing a lightbulb. The BC3 range is also made in the UK, which aside from actually supporting local jobs, means that the units are not transported from China as, say, Tesco Value CFLs are. That saves on transportation energy, at least, and while – looking briefly – I couldn’t find a patent for the BC3 system, I presume Eaton have it protected somehow, otherwise there would surely be cheaper BC3-compatible bulbs available. Overall, this is a clever commercial attempt to respond to a governmental decision made with environmental protection in mind, and as such probably ought to be filed along with optimum lifetime products as something where the intention is to benefit society as well as benefit the manufacturer, at the expense of additionally inconveniencing the user. 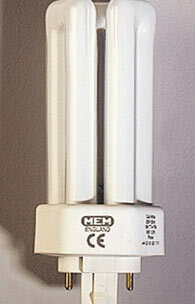 I feel focusing on a system of built-in base units, with readily available standard replacement tubes (either CFLs or linear fluorescent format) would have been more user-friendly as well as reducing the amount of electronics needlessly thrown away, but it would not have permitted a razor-blade model to the same extent. It will be interesting to see how the BC3 story develops in the years ahead: will they become commonly available, and how high will public awareness be? There will probably be many more similar products and systems in the next few years using technology to enforce government policy, particularly in an environmental context, and the Eaton MEM BC3 will be an important case study. *Of course, there’s a lot that ought to be said about the real merits of a large-scale shift to ‘energy saving’ bulbs, particularly in relation to Australia’s decision to phase out incandescent filament bulbs entirely, the European Lamp Companies’ Federation’s focus on the same, Gordon Brown’s announcement on this, and campaigns such as Ban The Bulb.